If you are using either Mint.com or Quicken Online to manage your finance, you probably have already heard the big news today that Intuit, owner of Quicken Online, is buying Mint.com. While changes can always be expected when such acquisitions occur, Intuit has promised to keep both popular online money management tool free for existing and potential customers, which is definitely a good news for those who are using either of them. A few months ago, shortly after Microsoft decided to quit offering MS Money, I wrote a post on where to find alternatives to MS Money, which included bother Quicken Online and Mint.com. While both systems are excellent personal finance tools, they aren’t the only alternatives out there when it comes to manage your money for free. In fact, the arena is getting more and more crowded. One of many players in this arena is manageME 7, another money management website that offers both paid and free tool. At the first look, I feel the interface of manageME 7 is rather simple. It offers a few basic functions such as manage accounts (bank, cash, credit, and loan accounts) and transactions, build a budget, set up an alert, and generate reports. While I haven’t tried every tool out there myself, a few that I did used, such as Mint.com and Quicken Online, allow users link their accounts at banks and credit card issuers directly from the site so that transactions can be downloaded right to the manage tool once the connection is set up. This not only is convenient, but also prevents errors from happening as all are done automatically. At manageME 7, however, things are not so automatic. Once I set up an account to manage in manageME 7, I can choose either to enter transactions myself manually, or import them from a statement that is downloaded from a financial institution. Obviously, I am not going to try to each transaction myself, so I chose to import a bank statement (in this case from ING Direct). Before importing the transactions, I first downloaded transactions from the past 2 months into a OFX file (manageME 7 supports a few file format such as OFX file, QIF file, CVS file, and BAI file). Then I uploaded the file into manageME 7. The process of downloading and uploading transactions was quite straightforward. However, the result wasn’t really what I expected to see, probably due to the limitation of the file itself. The downloaded transaction file contains the right information such as transaction date, type, and amount. However, the final balance isn’t really the account balance, but the balance of the period specified when the file is downloaded. I tested with two file formats, OFX file from ING Direct and QIF file from EverBank, and got the same result. I also tried CVS file downloaded from ING Direct, but the system generated an error, saying the file format wasn’t correct. I have to say that after seeing what Mint.com and Quicken Online do with transactions, I am a little disappointed by manageME 7 not allowing users to interact directly with their accounts at banks (and probably the same for credit card accounts) to avoid such “error”. If I have to choose, then I prefer the way Quicken or Mint manages transactions: less hassle, more accurate. The reason why accurate transaction information is important is that other management functions, such as budgeting, rely on complete and accurate transactions to work. I also played a little other functions like set up an alert and generate reports, though I have yet to fully explore manageME 7. Thus, it’s possible that I may have missed the functionality that separates manageME 7 from other online personal finance tools. If you are interested in trying manageME 7 out, the company is offer the first 50 users who register using this link a free Plutus Package (priced at $15 for 40 days). Check it out to see if you like it. Should I Renew AAA Membership? 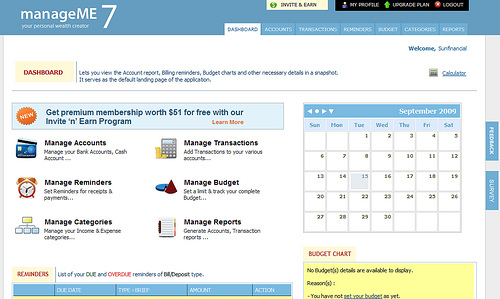 I’m glad that online financial management is getting more powerful. Since I like to switch between Windows and Linux, I prefer a platform independent solution. I find myself using both Yodlee and Quicken Online to take advantage of the several features that they offer. I have noticed that Mint offers more up-to-date transactions, which makes me wonder why there is this difference between the services. And on the other hand Mint is lacking cash flow forecasting functions.